The organ that attaches a marine algae to a substrate is called a "holdfast". Unlike a root, a holdfast derives no nutrients from this intimate contact with the substrate. Most cultures with access to Porphyra, a genus of red algae use it as a food or somehow in the diet, making it perhaps the most domesticated of the marine algae. It is known as laver, nori sushi (Japanese), amanori (Japanese), zakai, gim sushi (Korean), zicai (Chinese), karengo, sloke or slukos. In Japan, the annual production of Porphyra spp. is valued at 100 billion yen (US$1 billion). Laminaria (a genus of brown algae) is used in the production of potassium chloride and iodine. 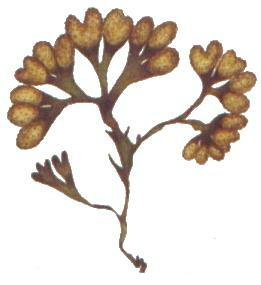 Dried laminaria sticks can be used medicinally to induce dilation of the cervix. An additional medicinal use of algae is the product agar which is used as a culture medium for growing bacteria in laboratory settings. Rinse the alga to remove salt, sand and foreign particles. Change the newspaper and blotter paper daily for the next five days or until the samples are dry. Description: Fucus vesiculosus is a very variable alga. It can grow to 100 cm or more and is easily recognized by the small gas–filled vesicles which occur in pairs on either side of a central midrib running along the center of the strap-like frond. It was the original source of iodine, discovered in 1811, and was used extensively to treat goiter, a swelling of the thyroid gland related to iodine deficiency. A common food in Japan, bladder wrack is used as an additive and flavoring in various food products in Europe. Bladder wrack is commonly found as a component of kelp tablets or powders used as nutritional supplements. It is sometimes loosely called "kelp", but that term technically refers to a different seaweed. This page was last modified on 29 September 2018, at 21:40. This page has been accessed 44,101 times.